The Midnite Johnny Band . . .
Midnite Johnny has worked extensively throughout his native USA and has established a reputation as one of South Florida’s most powerful Blues influenced guitarists. His resume includes working with Harvey Mandel (Canned Heat; Charlie Musslewhite, John Mayall) from 1986-88; Thom Doucette (Allman Brothers) 1988-89 and Warren Caesar in 1989; as well as South Florida favourites Kilmo & The Killers (1990-94) This band toured extensively on the US Blues circuit and was the featured opening act for the likes of Fogat, Jeff Healy Band, Johnny Winter, Mike Pinera and a host of others. The Killers also backed up Dan Ackroyd for a couple of Orlando Florida gigs. Johnny also worked briefly with James Cotton as stand in guitarist as well as with Bo Diddley on several gigs during 1989 and 1990. 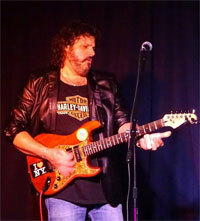 Now based in the UK he is quickly establishing himself here as a master of the blues guitar and fast building a dedicated following throughout the UK and Europe appearing at the Warrington and Nantwich Blues Festivals; and the Colne R & B Festival to name a few, the Colne performance being transmitted live on BBC Radio Lancashire. His playing style is varied and if you close your eyes he could be any one of his guitar heroes Eric Clapton, Freddie King, Elmore James, Albert Collins and many more. Manchester (England) born Paul Burgess is notable for his association with a wide range of British rock and folk-rock bands. In addition to extensive session work, he has been an official member of 10cc, Jethro Tull, Camel, Magna Carta, and The Icicle Works. 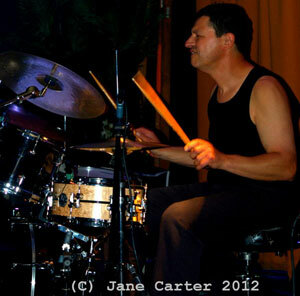 Burgess started playing drums in 1965 and played in 60s Stockport four piece band Axis, which he left in July 1971. He then joined 10cc on their 1973 UK tour and subsequently played with the band on most of their tour, until 1983. During the 1977 10cc tour Burgess was joined on drums by Stuart Tosh. Burgess continued his association with 10cc on their 1978 album Bloody Tourists, Look Hear? (1980) and Ten Out of 10 (1981). Paul also played drums on Graham Gouldman’s Animalympics (1980) soundtrack and Eric Stewart’s first two solo albums; the soundtrack to the French film Girls (1980) and Frooty Rooties (1982). During 82 Burgess was briefly a member of Jethro Tull, replacing Gerry Conway, and touring throughout Europe and North America with the band. Burgess rejoined 10cc for their 1983 tour, after which 10cc broke up. 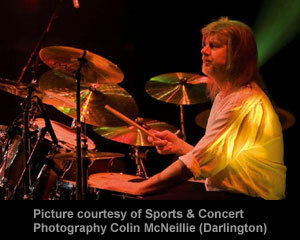 In 1984, Burgess became a member of progressive rock unit Camel, replacing Stuart Tosh, who had also been a member of 10cc. In 1986, he toured with Joan Armatrading and returned as a member of the reformed Magna Carta. During the late 1980s, Burgess also did extensive live work with a range of artists including glam-rocker/rockabilly revivalist Alvin Stardust and disco singer Gloria Gaynor. In 1990, Burgess replaced drummer Zak Starkey in a late-running version of the new-wave rock band The Icicle Works. He recorded one album, 1990s Permanent Damage, before the group broke up. In 1992, Camel reformed with Burgess on drums. He stayed until 1993, recording a studio album (Dust and Dreams) and a live album (Never Let Go) with the band. In 1995 Paul joined Chris Farlowe’s R&B styled backing band and worked with Farlowe steadily for the next decade. 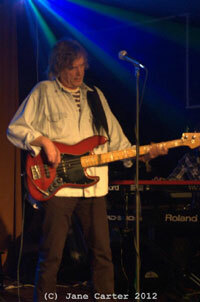 In 2000, Burgess once again re-joined 10cc for a series of live shows. His energetic style demands the attention of the fans. Tim has been playing professionally for over 25 years. In that time, he has toured and recorded with many musicians. He joined the Norman Beaker Band in the mid-seventies and with them backed, and recorded with, many American and British Blues and R&B artists, including Jack Bruce, Chris Farlowe, Lowell Fulson, Phil Guy, Johnny Mars, Paul Jones and many more. One of the most in demand bass players in the North West of England, Norm Helm has played as a member of jazz fusion guitarist Gary Boyle’s Band as well as working with many of the local area jazz greats such as sax legend Harold Salisbury. He has worked with many of the local area jazz greats such as sax legend Harold Salisbury. Not only a great jazz player he is well versed in blues and rock styles.